A major biotech company needed a custom programmable reagent cartridge filling machine for consumable reagent trays used with their DNA sequencing platforms. They were looking for the flexibility to handle any combination of reagent tray design and recipe in their configuration matrix. The client also needed custom equipment to apply foil seals to the filled trays. 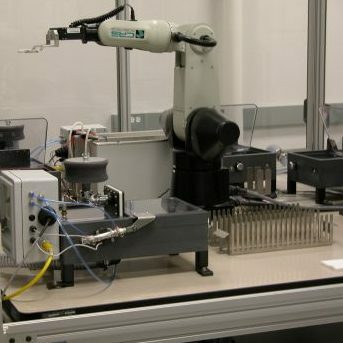 Both pieces of equipment were to be used in a clean room manufacturing setting. Loading and unloading of reagent trays was to be performed by an operator. 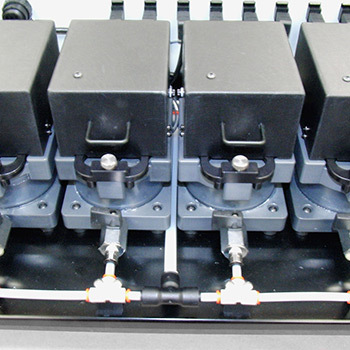 Fill volume accuracy over a wide range of volumes: The system needed to handle large dispense volumes for buffer solutions, and small dispense volumes for reagents. Both fills needed to be fast and accurate to avoid wasting expensive materials, and avoid wetting the sealing interface. Avoiding spills while in process: Since cartridges were unloaded manually, and transported from the filling to the sealing station, the cartridge design would need to be modified to discourage sloshing. Configurability: Changeover from one cartridge layout and fill recipe to another would require software setup and physical plumbing changes. 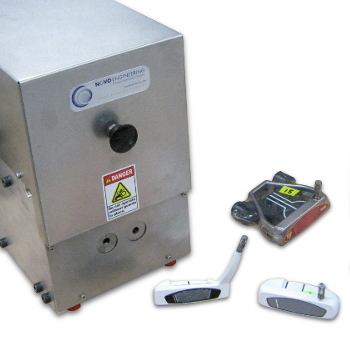 These modifications had to be quick, intuitive, and efficient for a technician to implement. 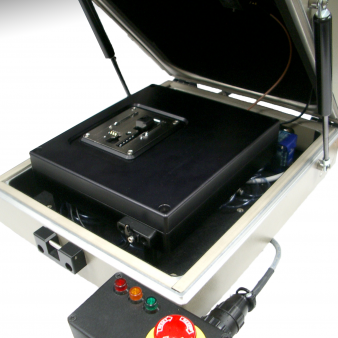 Sealing station: The sealing station needed to be designed with easily exchanged nests for different reagent tray geometries and settings for time, temperature, and pressure appropriate for the geometry of the sealing surface. 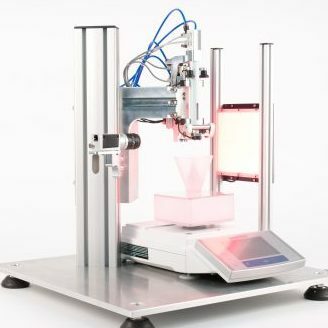 The design team added precision weighing as a primary feedback to control dispense volume accuracy, and modified the off-the-shelf peristaltic pumps by adding position feedback as a secondary measure. A custom control algorithm was implemented, which modified pump commands based on feedback, and compensated for variations in feed pressure and tubing wear that occurred over extended runs. Cartridge design principles were developed to permit handling between stations without the risk of fluid spillage. Color coding, quick-connect fluid connectors, and an intuitive user interface to the software made changeover from one SKU to another fast and convenient. Settings on the sealing station were adjusted, and the correct nest was confirmed, based on the model of tray that was detected by the barcode scanner. The equipment that NOVO designed added precision and automation to the client’s process. The custom application software developed by NOVO was integrated into the client’s manufacturing execution system (MES) software, which enabled logging of all process parameters for each filling and sealing operation to aid in optimization and failure analysis. The equipment was so successful in initial testing that multiple copies of each piece of equipment were ordered, with minor changes, within a few weeks of delivery of the original machines.